There is a page of frequently asked questions and a copy of the presentation given by Dr Richard Newman on the archaeology of the site (large file - 10 MByte). Playford lies in the picturesque Fynn Valley about midway between Ipswich to the South West and Woodbridge to the North East. The village is home to around 200 people, who share the tranquillity of the surrounding green valley, water meadows and ancient woodlands. St Mary's Church stands sentinel on a small rise to the north east of the village, and in the churchyard there is a memorial to Thomas Clarkson, who once lived in the village and was the driving force behind the eventual successful campaign to outlaw slavery. Here too, is the grave of George Biddle Airy, 7th Astronomer Royal. Playfords Village Hall stands in the centre of the village and is used extensively for regular activities such as art classes and parent and toddler groups, and it is hired out for parties, wedding receptions and other events. Full details of the facilities and availability are available on the village hall website. In the village playing field there is a well equipped childrens play area, built using money raised by the villagers, a football pitch, which host regular matches involving children from the village. The playing field also has a competition sized boules piste, built with the proceeds of local fundraising which is regularly used by the villagers and plays home to the local boules team. Visitors to Playford comment upon its rural charm; although the centre of Ipswich or Woodbridge are only fifteen minutes away, Playford has the feel of a village that is further off the beaten track. 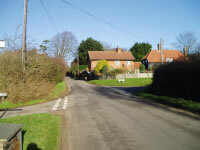 The rural beauty is enjoyed by people walking along the valley, following the sign-posted Fynn Valley walks that link Playford with her close neighbouring villages, the Bealings, Culpho and Tuddenham. Please click on "Links" on the left of the screen to access local websites in and around Playford. Playford recently completed a joint Parish Plan with Great Bealings and Little Bealings. You can read this online and we now have a page of information that was requested as part of the parish plan survey exercise. If you do subscribe to the list, you will only receive mail from the administrator - Phil Holmes. Nothing is sent automatically without human checking. We also aim to send to you using the "BCC" (Blind Carbon Copy) field, so your email address is not publicised further. Little Bealings Parish Council is keen to hear from everyone interested in being part of a group looking into a possible Community Buy-Out of The Admiral's Head. Please email or call the Clerk, Carol Ramsden, on 01473 610088, for more details or to register your interest.